Honestly, I'm not making these names up! 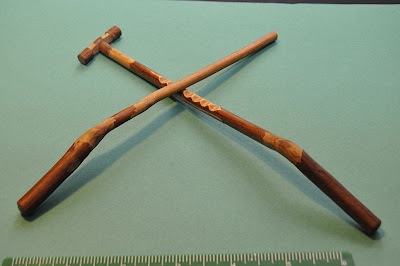 You can see an old fashion style whimmy diddle, also called a gee-haw, or hooey stick among other things, in the picture below from Wikipedia. We followed instructions from The Science Toymaker , and used a one foot long piece of wire hanger, instead of a notched branch. Click the link for step by step instructions, and a short science lesson behind the toy. Most of the old folk toys use some level of science, both in their construction, and use. And, The Science Toymaker, a favorite site of ours, explains many of them. The Man of the House was good enough to cut the hanger, with wire cutters, and shape it, with needle nose pliers, along the lines of the instructions (older children could manage this without any trouble). So, all we had to do was cut a piece of cardboard into a three inch by one inch propeller, and punch a hole in the center, with a hole punch. After sliding the propeller onto the end of the hanger, just in front of the little loop, you hold the wire by the larger loop, and run a pencil, at a slight slant, over the bumps in the wire. If you do it right the propeller will spin. It's just tricky enough, to make it fun for the whole family. As a post note - after publishing this post, I did a little more research, and discovered the gee-haw name comes from the fact that you can change the direction of propeller spin, by changing the direction you run the pencil across the bumps. In our case, that didn't work, but running the pencil along the underside of the bumps did. We thought that was pretty neat. I love the names of these folk toys! I was meeting with a friend today about our history plans. One of the lessons is about the toys from colonial times. I'm planning on using some of your ideas, so keep 'em coming. And I agree with Christy, the names are the best!